If you let your pool deck build up dirt and grime, its appearance and even performance could suffer, thus lowering your properties value over time. But you can maintain its value by calling Nashville Clean Windows and Pressure Washing for regular pool deck washings! One important component of your pool to maintain is its deck. Your pool deck will endure an almost non-stop attack of dirty things: grimy feet, algae buildup, mud, etc. 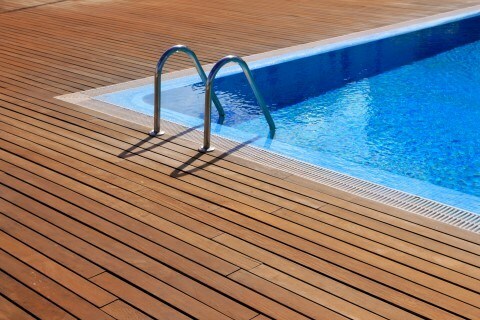 As these dirty things build up, your pool deck can become not only unsightly but also slippery and dangerous! If your pool deck is in this kind of condition, call Nashville Clean Windows and Pressure Washing, your pressure washing company, for a pool deck cleaning. We'll get your pool decks looking their best in little time at all thanks to our thorough cleaning service. A pool can do a lot to bolster your property value -- but only if it looks like something anyone would be willing to pay more for. If your pool is an unsightly, discolored mess that's teeming with unhealthy growths, though, you can't ask very much for it at all. If your pool is in the kind of condition that diminishes your property value, call us for a pool deck cleaning. We'll knock away the years of grimy buildup, making your pool deck look beautiful and new once more and helping you to command the highest price possible for your home! Being made of tile, concrete, and other hard materials, a pool deck can leave you hurting for sure if you slipped and fell on it. And since pool decks are often wet, the chances of slipping are already high. Now add algae growths, and the chances of your falling and busting your head open are unnervingly high. While we can't do anything to remove the water from your pool deck, we can remove the algae that might be growing on it. With a pool deck cleaning, we can knock away the slick growths that are present, thus lowering the likelihood that you'll slip and fall around your pool deck! If you are looking for Nashville pool deck cleaning professionals, then please call (615)-669-8098 complete our online request form.